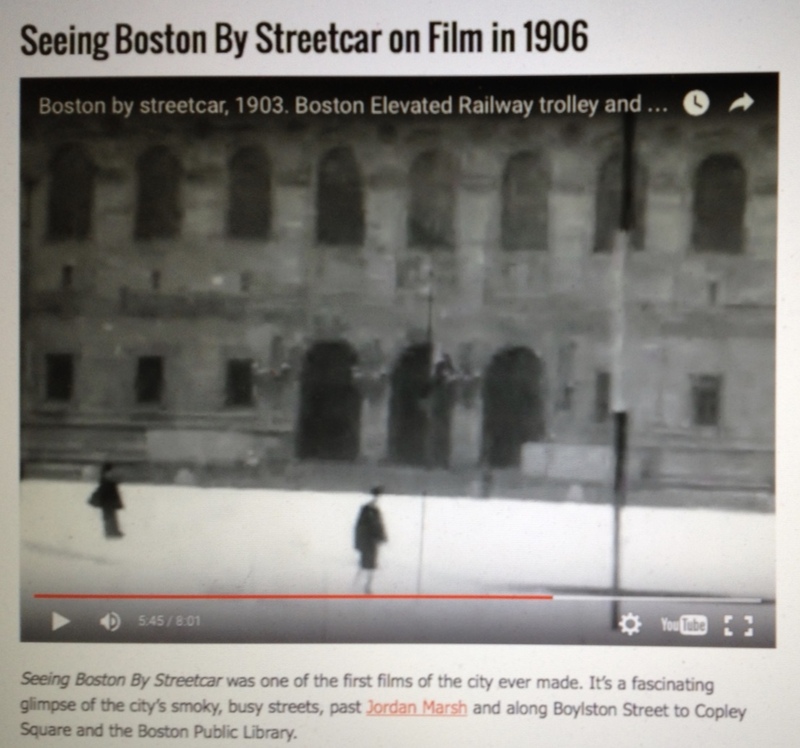 If you have eight minutes to spare for a fun little historical video, go to this New England Historical Society page to view a streetcar ride in the heart of Boston during the early 1900s. Those familiar with Boston will recognize a fair number of buildings that remain intact (more or less) today, including the Central Branch of the Boston Public Library, pictured above. With some unfortunate exceptions, mainly parts of the city where a myriad of “urban renewal” projects and other monstrosities (like the unsightly City Hall) supplanted fine old buildings, a lot of Boston’s vintage structures are still with us. Some happen to be of great historical significance. As you watch the video, notice how the people are dressed. Perhaps reinforced by the grainy quality of the black & white video, they look very much the same. I was tempted to attribute this to Boston’s historic lack of fashion variety. But I think it has more to do with the fact that some 110 years ago, a lot fewer people expressed their individuality through choice of clothing, at least to the point where it would be noticeable on old film footage. I love old films like this. They are typically raw, soundless, and absent any sense of story, but they’re the next best thing to being able to jump into a time machine for a quick walk through a city over a century ago. Hat tip to Rosina-Maria Lucibello for this video.